The most popular cars on sale in India are unsafe. That's the findings of the international crash testing body, Global NCAP. 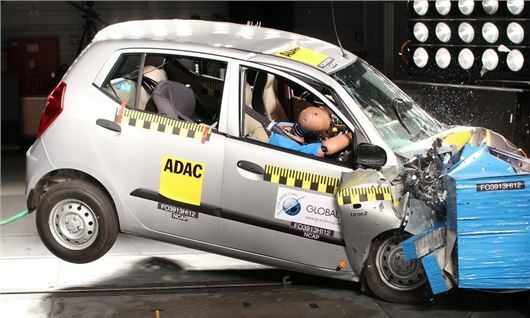 All of the Indian cars chosen for testing by Global NCAP scored zero stars in 42mph frontal collisions. According to the Chairman of Global NCAP, Max Mosley, safety levels are 20 years behind the five-star standards of Europe and America. The models tested included the Suzuki Maruti Alto 800, the Ford Figo, the Tata Nano, the Hyundai i10 and the Volkswagen Polo. The latter two models are also sold in Europe, however the regulations for safety are much more stringent here and consequently the cars built for Europe have more safety technology as standard and score better in NCAP tests. In India there are no minimum standards for crash safety at all. Vehicles are not required to undergo any kind of tests by law. What’s more disheartening is the fact that many cars manufactured in India for export to places like the UK are built to a higher safety standard than those destined to remain in India, despite factories having the means to install features like airbags as standard if they choose to. The only vehicle of those tested to feature an airbag was the Volkswagen Polo, however airbag fitment was of less concern than the body structure, which was so weak in all but the Ford Figo and Polo that an airbag wouldn’t have significantly reduced the chances of serious injury occurring. On balance it is worth mentioning that motorcycles are incredibly popular in India and the vast majority of four-wheeled vehicles, regardless of NCAP score, will provide better protection than motorbikes or trikes. In fact, the premise behind the Tata Nano was to get people off two wheels and into a car. The zero star Global NCAP test video for the Nano is below. Horrific video - obviously profit before safety.